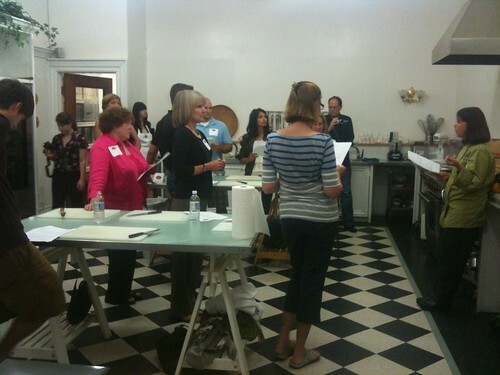 NOTE from IheartPGH: This post is also posted at Andrea’s blog – Having Fun Storming Your Castle – occasionally IheartPGH is invited to attend events and write blog posts – here is Andrea’s post about cooking school. I was invited to attend the event, sponsored by Shop ‘n Save, and did so free of charge. All opinions expressed are my own. But you knew that already. Gaynor talked us through everything we were going to make before we broke into two smaller groups. 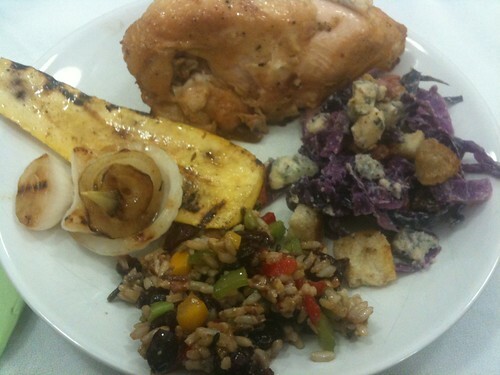 Each group then made all the dishes: orange rosemary chicken, grilled vegetables, cabbage salad with Stilton and bacon, wild rice with vegetables and dried cranberries and an almond and fruit torte thing for dessert. 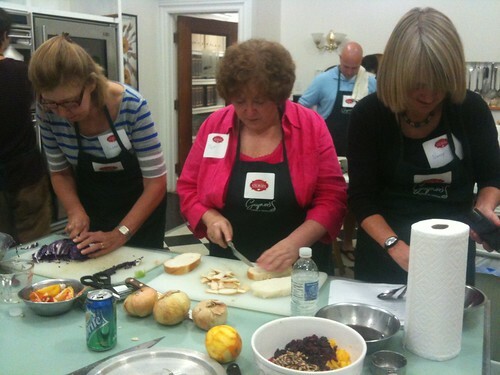 We were pretty much on our own with the recipes, and Gaynor floated between the two groups offering assistance or feedback as necessary. Not everyone in attendance was tremendously confident in the kitchen, so it was interesting for me as a participant-slash-observer to see the hits and misses, as well as the useful tips Gaynor provided. 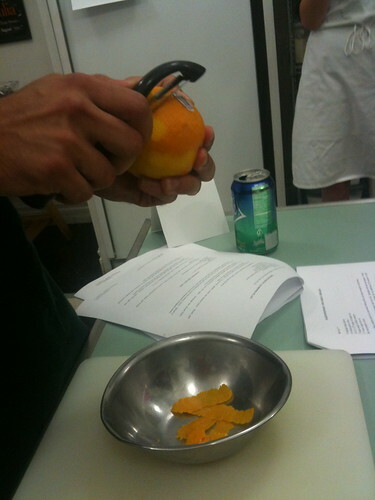 For example, I’ve never done orange zest with a potato peeler. 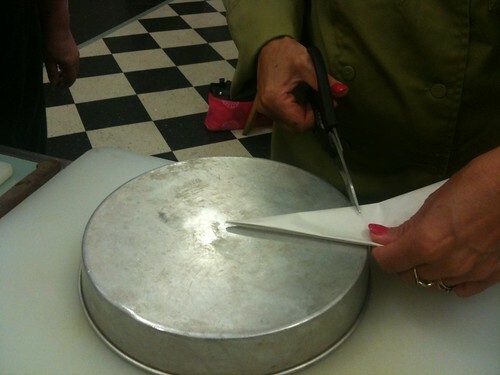 And for the torte (which Gaynor called a flan, so I probably should as well), she demonstrated an easy way to cut parchment for the bottom of a baking pan. Turn the dish upside down, fold the parchment paper in half on a diagonal several times so you end up with a triangle, place the point at the center and cut around the edge. There was a lot of prepping, including chopping, dicing, toasting and blanching. In fact, I think it’s pretty rare for a cooking class to have nothing pre-prepared for the students. That was good for the most part, since everyone got to see the entire process for each dish. But it also made for a long evening. 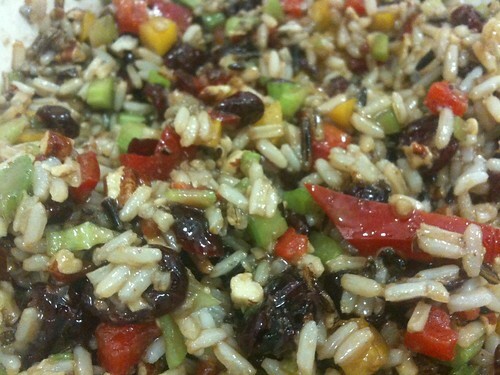 I was a huge fan of all of the fresh produce and bright colors in most of the recipes, like the red and yellow peppers, celery, dried cranberries and toasted nuts in the wild rice. 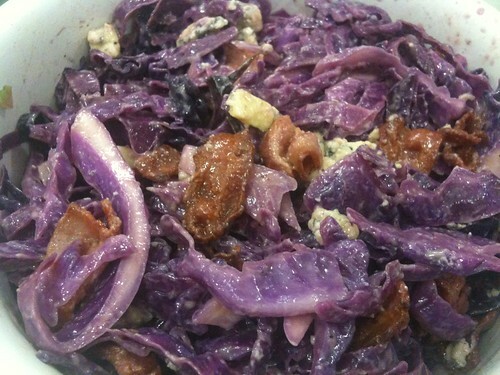 Or the purple cabbage with bacon and Stilton. When Gaynor was introducing that dish, she said “I am English, you can probably tell, and as far as I am concerned Stilton is the ONLY blue cheese in the world.” I have to agree, except for my favorite dressing. The last thing we put together was the dessert (here’s the actual recipe), and I offered to deal with the fruit on top. 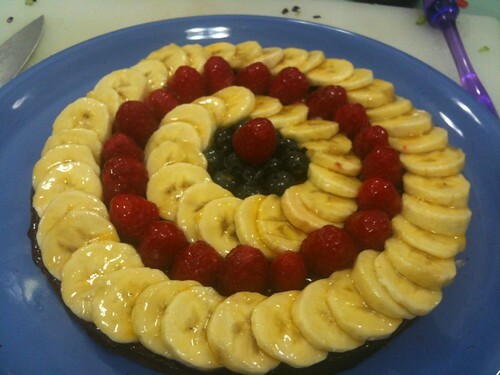 Pro tip: if you’re using bananas to decorate a torte or flan like this, a) slice them very thin, b) swish them around in lemon or orange juice so they don’t brown and c) overlap them carefully, following the edge of the cake. The very last banana gets tucked under the first so you have a continuous ring. Of course the best part about a cooking class, besides the learning, is the eating. So colorful! So stuffed! 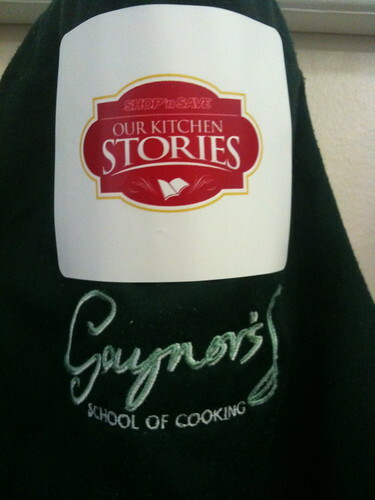 All of Gaynor’s classes end with a meal, except a bread baking class where you might opt to take the finished bread home. You can check out the upcoming schedule on her website as well as register online. I was pleased to see she offers kid’s classes, too, since Avi’s been asking if he can go to another cooking class for his upcoming birthday. I am not yet registered for Our Kitchen Stories, but I looked through some of the 500+ recipes already posted to the community. It definitely goes beyond french fries on salads, covering everything from the predictable (pierogies and haluski) to the unusual (Bengali mustard fish). I was stoked to see #fishtacos, especially. And ultimately, because this is Pittsburgh, there’s a whole section for tailgating food. Enjoy.